My Mysterious Musings | Where you never know what you're going read. As I dug into one box, I pulled out a dirty, plastic grocery bag with the Sharpie-scribbled words “from Lake Erie” on it. I opened the wrinkled filthy mess to discover three smooth rocks. I shouldn’t have been surprised at the contents since Mom kept just about everything. And I mean everything. Yet I was shocked enough to iterate a “What in the world?” response. I showed them to mom, and we both laughed. She had no clue when she had acquired them, but their future was in her hands on this particular day. The goal was to drastically downsize the amount of her belongings in order to fit into my sister’s RV. That’s why I suggested she let me return them to their home. I live in a quaint town on the shore of Lake Erie, so it seemed like the logical thing to do. Little did we know that a few months later, Mom would no longer be with us. The rocks Mom gathered from Lake Erie. After the funeral and I returned home to Ohio, I eventually started sorting through the boxes and boxes of stuff I had obtained from the old house. Pictures of ancestors (of course, many of them weren’t marked), school books, dishes, clipped poems upon poems, and the crumpled grocery bag with rocks from Lake Erie. With mom’s death so fresh, I couldn’t bring myself to return those stones to the water but couldn’t put them back in the old bag either. They are now displayed on my entertainment center as a reminder of my mom and that special time of sorting through her collection of life. The story of the rocks is more than a story, though. It’s a precious memorial in honor of a life well-lived. She was the rock, the foundation of our family. Now, I am not one who sets up a memorial to the point where it becomes a shrine. 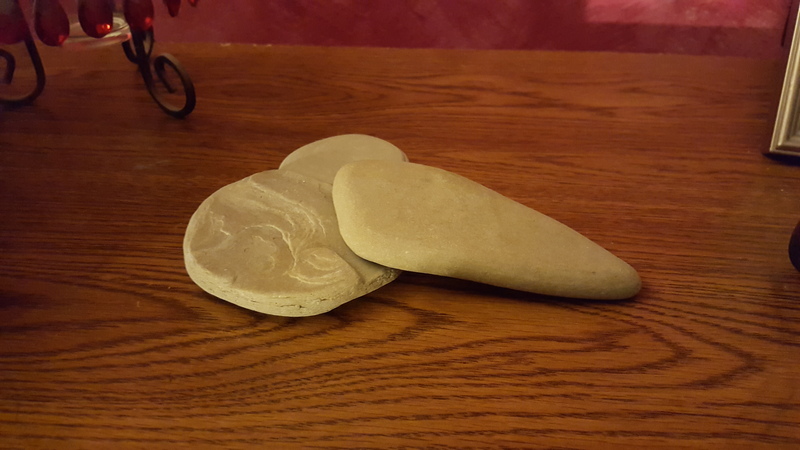 Those rocks are on display in my living room because they also symbolize God bringing me through the new reality of having neither parent alive. When Joshua and the Israelites successfully crossed the Jordan River to finally take hold of the land promised to them by the Lord, they gathered a bunch of rocks (twelve to be exact) from the middle of the river, then they placed them in a pile as a reminder. In the same way, these rocks from one of Mom’s trips to Lake Erie are a reminder of all of life’s trials I have come through with God’s help. Even one year later, it’s impossible to describe with words what it was like to watch her take her last breath. Those rocks remind me that no matter what obstacles or difficulties I face, the Lord will be there to guide me through them. My mom was an example of that. 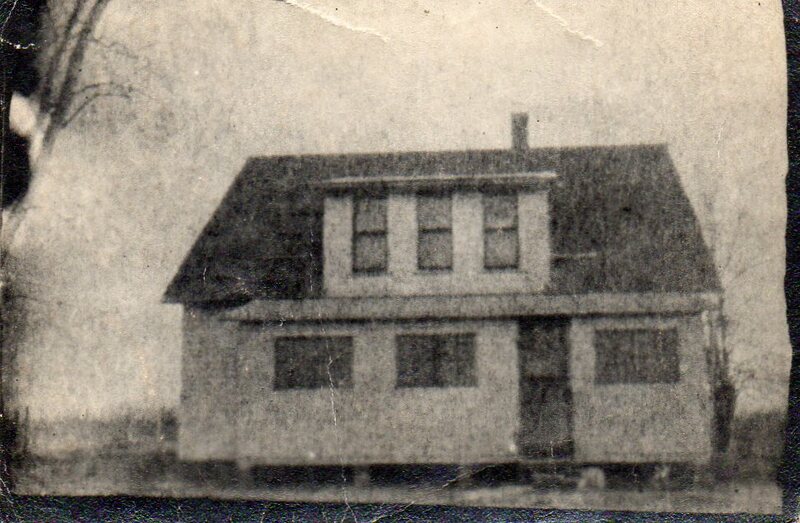 Mom’s childhood home. She took this picture with a camera she made in Physics class. She lived through the Depression on a farm, had her first child born breech, faced uncertainty when her husband’s job transferred him to another state, had a grandson die as an infant, lost her husband after fifty years of marriage then a younger brother passed away a year later, and went through a mastectomy at 84 years old like a trooper. Seriously, what elderly woman leaves the hospital the day after losing a body part and goes out for lunch? That is a small sample of what life threw at her during 88 years. She was the rock of our family, because the Lord was her rock Who helped her along the way and allowed her to finish well. 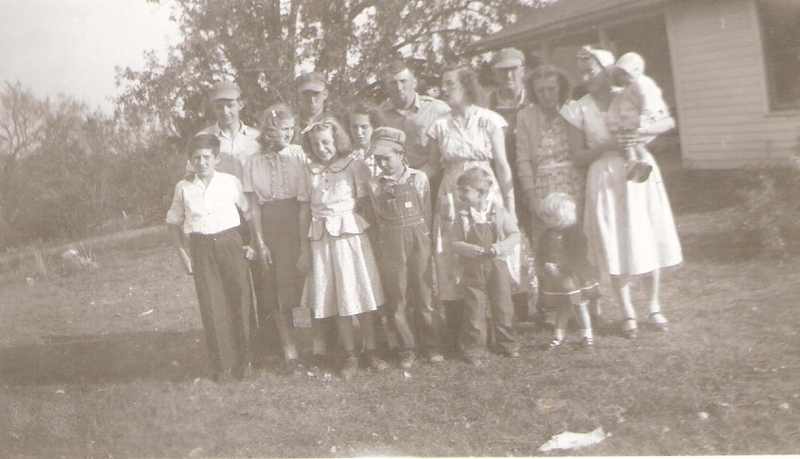 Mom with her siblings and parents. She’s on the right, holding a child. 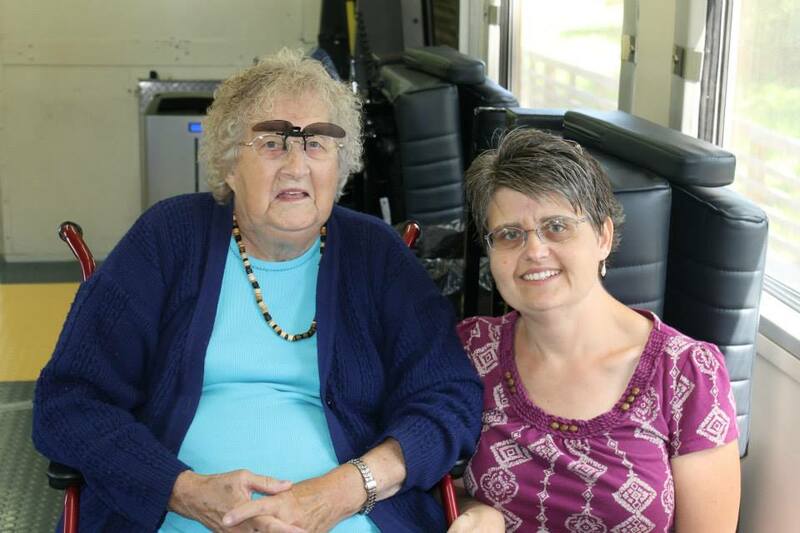 My mom & I on a scenic train ride summer of 2013. We shared a love of trains! The small Illinois town I grew up in is approximately the same distance from St. Louis as it is from Chicago. What that means is about half the town is made up of Cardinal fans while the rest consists of Cubs fans. I’m sure there are some White Sox fans sprinkled around town, but if you’re a fan of any other team, it can only mean one of two things: 1) you’re a transplant from another state or 2) you just plain don’t care about baseball. Throughout the Bible, God uses the underdog. Probably the most well-known was David. David was a scrawny teenager when he knocked Goliath flat on his back. He was basically the runt of the family whose brothers thought he was only good for watching sheep. Yet before he ever went up against the giant, he took on lions and bears with a club whenever a sheep’s life was in danger. Turning down the armor of a warrior, David took down a 9-foot soldier whose armor weighed in at a hefty 125 pounds. How? The ancient form of baseball: a rock thrown from a sling! It may be a team full of young guys and rookies; but ever since the season started, they believed they could do it. According to the following article from USA Today, published back in March, they believed they would knock out the St. Louis Cardinals and the Pittsburgh Pirates: http://www.usatoday.com/story/sports/mlb/2015/03/08/chicago-cubs-2015-world-series/24619741/ And guess what? They just did! Even some of their fans (including me) had doubts they would pull it off. Yes, I admit I didn’t have as much confidence in them as they have in themselves. I’m thankful for that. Only those who are confident in themselves and ignore naysayers can take on the world and win. Yes, I know just because a team hasn’t won the World Series since 1908 and hasn’t played in the World Series since 1945, doesn’t mean that they deserve to win it all. So let’s take a brief trip into history. Another well-known World Series drought was the Boston Red Sox. Their last win was 1918 but made a few appearances before finally winning in 2004. Legend claimed it was the Bambino’s Curse that kept them from claiming the big trophy. Before taking it all in 2004, it had been 86 years since their last championship and a mere 18 years since they had taken on the Series. The Cubs’ drought is much more severe: 107 years since a win and 70 since “making it.” My point is, if the Red Sox can break their so-called “curse,” so can the Cubs. I realize this is my subjective point of view because I’ve spent my entire life as a Cubs fan, but even sports experts have predicted the Cubs taking it all this year. Fans of other teams are even cheering on the Cubs. With that kind of support, how can they not win? We can even learn from this year’s Cubs team. It doesn’t matter if you’re in last place or the underdog, if you have confidence and believe in yourself, you can accomplish great things no matter how big the obstacles may be. 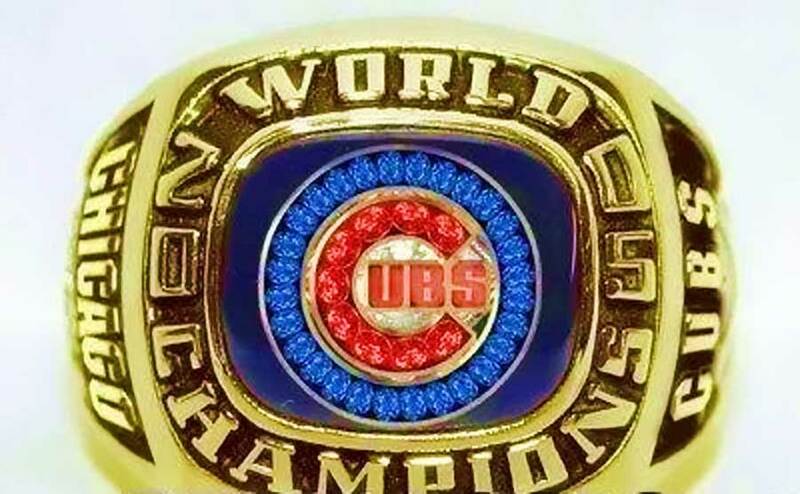 Who do you think will win the 2015 World Series? “I swear, it wasn’t me.” The bloody carcass of the neighbor’s prissy Shih Tzu lay unmoving in my driveway. Sure, that yelping ball of fur tore up my daffodils, but I’m not so vindictive that I would go after it with my car. I shook my head. Where did she get the energy to scream at full power? I’d love to know her secret. My own energy level had been missing in action for several months. That dog was useless. It had finally pushed me to the edge. This morning it was yapping at me nonstop while I was replanting my ruined flower bed. My only regret was that I hadn’t run over it sooner. And now that I’m on the receiving end of Joanie’s wrath, it’s too bad she hadn’t been on the other end of the dog’s leash. “I’m not lying. I’ve been inside all day cleaning.” I knew I couldn’t convince her of my innocence when she was out of her mind with grief. “I’m sorry about your dog, but I’m not responsible.” I couldn’t continue to face her, so I turned and walked into the house. I couldn’t take any more of Joanie’s hysteria. Overly emotional women make me want to go on a homicidal rampage. They’re weak for not being able to control themselves or their hormones. Inside, I had my own emotional breakdown. Crying in front of Joanie would show my own weakness and sorrow at the loss of life, and I couldn’t let her see me cry. I collapsed on the couch and buried my face in my hands, allowing my tears to flow like Niagara Falls. A few minutes later, Erick sat down next to me. “Sweetheart, what’s wrong?” My husband wrapped his arm around my shoulders, enveloping me into his chest. That’s right. It’ll pass. Right after I’m admitted to a psych ward. Erick fixed his bright green eyes on me as I gasped in horror. One of my regrets in life is not writing down the many funny – and irritating – stories from my days of waitressing. Excuse me, there are no waiters or waitresses in today’s world. They’re now called servers. Either way, throughout my abundant days of waiting on customers in a sit down environment, I remember enough violations by restaurant patrons to narrow down the biggest ones to five things the general public should not do or say to their server, male or female. This is not an exhaustive list and please don’t take this as judgment on people in general, or even a gripe session. Consider it enlightenment from me, an aging woman who retired from waitressing years ago, to you, consumers who enjoy going out for a meal. There’s not much to say about this other than, don’t do it. It may be hard to believe, but this happens much more than it should. At one pizza establishment I worked at, there was a regular who would put his coffee cup out in the aisle and wave it around to let me know it was dry or near dry. I thought for sure one day he would clobber an innocent bystander with his cup. Just don’t. I know you want his/her attention, but there are other less annoying ways of getting someone’s attention than striking your thumb & forefinger together. This is a biggie. There’s a good reason why most restaurant workers don’t like Sunday lunches. Christians can be some of the worst tippers out there. Notice I said can be. Not all. Waitressing helped pay for my last three years of Bible college, and I got my share of these types of “tips.” One time, a family of six did exactly that. Not once. But twice, they left a dollar bill with a religious tract. The second time I saw it on the table while they were cashing out at the register. For a sliver of time, I considered returning it to them with a little verbal instruction on how to truly make an impression for Christ. And a dollar bill wasn’t going to cut it. Would you believe this was actually said to me? It was shocking to hear it from a sweet little old lady. My first reaction was to defend myself since the dining room was overrun by all sorts of people, and I was trying my best to remember everyone’s needs and running my backside off to fulfill those needs. But then I realized that chances were good a $5 bill never would’ve ended up in my hand even if I had remembered their refills. If your server isn’t cutting it, even after requesting something, don’t attempt to make him/her feel bad by explaining their shortfalls. They’ll get the message with a small tip. Really? You’ve come into a restaurant where you sit and wait for your food. At one family restaurant located in a touristy area, this question was often accompanied with, “We have a plane to catch in half an hour.” What I wanted to say, but didn’t, was, “There’s a Wendy’s right next door to the airport. How about you go there? You’ll get your food in five minutes or less. And you can even take it with you on the plane!” If your schedule is tight, please don’t sit down in a restaurant and expect to get your food as quickly as you would at a fast food joint. And don’t expect the server to ask the cook to put a rush on it, because you leave the hint that you’re in a hurry. It just ain’t gonna happen. I don’t care if you’re a non-morning person or having a bad day, don’t be rude. Captain Obvious might get that point, but it’s worth listing it. At one point in my waitressing career, I was a non-morning person serving breakfast, which is never a good idea. Yet I was able to refrain from being grumpy or rude to them even though I secretly wanted to slap the over-cheery, smiley morning people out and about at the crack of dawn, long before any sane person should be. Remember, rudeness looks bad on you. I realize by now you must think I hated those long gone days of serving the public, but I didn’t. Sure there were bad days and bad customers; but for every rude and cranky patron, there were at least ten friendly, wonderful, fun and appreciative people. My last night at one pizza joint ended with a group of those types of patrons. During the late hours, a large group of young people stopped in. I knew a few of them and mentioned it was my last night, and that I was moving to another state. As they were preparing to leave, I noticed they were huddled around one end of the table. When I went to clean the table, the entire tip was spread out. As I walked around to the other side, tears filled my eyes. There, spelled out in dollar bills and coins, was “thank you.” It was the best tip I had ever received in my ten years of waitressing. Not because of the amount, which was very generous, but because of the time and thoughtfulness they put into it. Dr. Peter Trent was tempted not to answer the phone. He had a pretty good suspicion of whose voice would be on the other end. She called several times each day, and the shrill of her voice was comparable to a whistling tea kettle. His assistant, who normally screened his calls, had poor timing to be at lunch. He knew the repercussions of not answering would be worse than the temporary pain his ears would experience. “Like you, they never believe what I tell them!” The phone went dead. From the first time he had met with her, Peter believed she would be afraid of her own shadow. Helping people deal with their fears and paranoia was his specialty, but something kept her from making much progress. Yet, he at least wanted to give her comfort, so he rang her back. That’s strange. She just hung up with me, but she’s not answering her phone. Peter wondered if she had Caller ID and refused to talk to him. He wouldn’t blame her, but an uneasy feeling began to settle in his gut. It felt like the after effects of the over spicy chili he had for lunch, so he ignored it. “Whatever she told you, it’s a lie.” After a click, he was left with silence. Peter looked at the phone with a puzzled look on his face. Ring, ring. It went off again while he was still staring at it. “Yes, Sergeant. What’s going on?” The chili’s after effects returned with a vengeance. Just as he parked his Mercedes into an empty spot halfway across the lot from the station’s glass front door, Peter noticed a mysterious looking gentleman leaning against a light pole at the edge of the parking lot. At 4:00 in the afternoon, the sun was hiding under a blanket of gray clouds, and the temperature was comfortable for an early spring day. But there was something familiar about the man. The way he stood with his hands jammed into the pockets of a beige overcoat reminded him of a man Peter saw occasionally outside his office building. Mrs. Jones had known the guy from somewhere, because she mentioned him in their sessions and even knew his name. Shaking off his uneasiness, he got out of his car and went to meet with the sergeant. “Follow me.” The young lady guarding the front desk escorted Peter down a hall to a conference room that wasn’t like the conference rooms he was used to from his days in the corporate world. It was small with only a 4-seater table and bare walls. “Sergeant Graham will be right with you.” Then she closed the door behind her, leaving him alone with his thoughts and his file on Rita Jones. Even though he knew he couldn’t give any details of their meetings to the police, he wanted to be accurate on what information he could give them. Peter looked up from the table at the sound of the door opening. “Dr. Trent?” Standing in the doorway was a middle aged man dressed in a pair of jeans and a navy blue police department issued polo shirt. He immediately regretted the assessment of Sergeant Graham as middle age since he was probably about 55, same as Peter. “I do too. Can you tell me what you discussed with Mrs. Jones today?” He opened a notebook and poised his pen above a blank page. Outside in the parking lot, a mysterious man leaning against the light pole felt the hard end of a steel object jabbed into his back. He heard a recognizable piercing woman’s voice say, “Bang, you’re dead.” Douglas Mitchell, the man known to many as the Broker, could not control the look of fear that spread across his face. Disclaimer: The first and last sentences were randomly taken from two different chapters in the book, “Eye of the God” by Ariel Allison. Everything else in between is purely from the deep, dark recesses of my head.